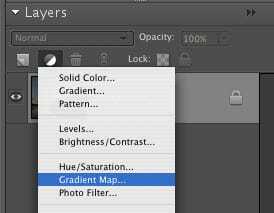 A Gradient Map filter in Photoshop Elements maps the tonal range of an image to the colors of a gradient fill that you specify. It might sound complicated, but follow the steps in this tutorial and you'll see that it's pretty easy. We're going to use a Gradient Map adjustment layer to give us an awesome sky. Keep in mind that your photo should have some fairly dark colors in the sky to make this work. If you have a very light sky the colors won't be as brilliant. Open an image with a sky you want to enhance. 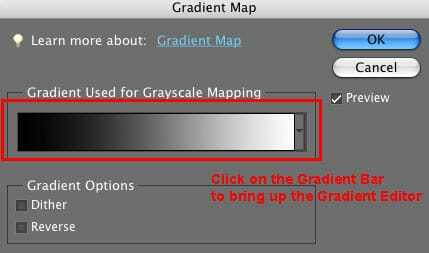 The Gradient Map dialog box will appear. 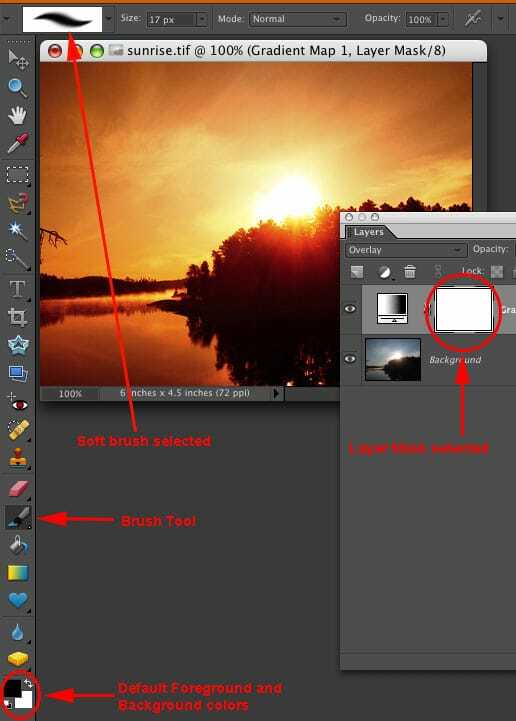 Click on the Gradient Bar to bring up the Gradient Editor. 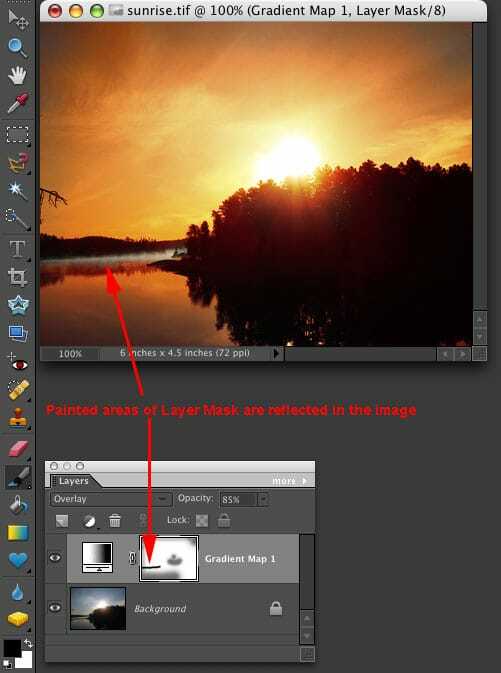 In the Gradient Editor click on the Color Stop arrow located under the gradient bar on the left. 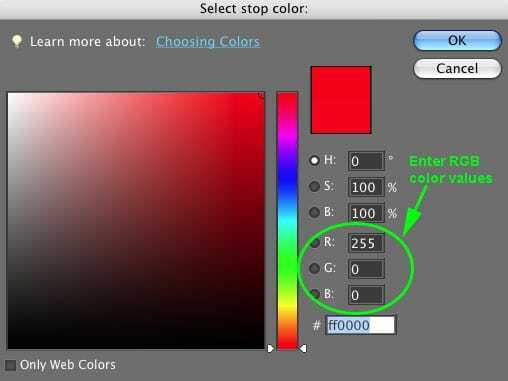 Then click on the Color box to open the Color Picker dialog box where you will change the color of the stop. From the Color Picker set your RGB values to 255-0-0 as shown below. ​Now your back at the Editor. Click on the stop on the right side of the gradient bar and then click on the Color box again. This time in the Color Picker set the RGB values to 255-255-0 for a bright yellow and click OK. Click OK 2 more times to verify your settings and close the dialog windows. Whew, let's move on to Step 3. Your image will look very bizarre, don't worry we're going to fix that. There are a few areas where I want some of my original Background layer to show through. I can do that by painting with black onto the Layer mask. First I need to make sure that my Foreground color "(the top square located at the bottom of the Toolbox) is set to the default color of black. I can press the letter D to set it to Default. 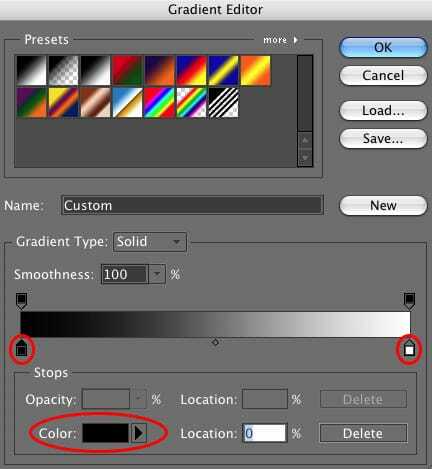 I also want to make sure that I have my Adjustment layer selected in the Layers palette, and that I have the Brush tool selected and set to a soft brush in the Options bar located at the top of my document. 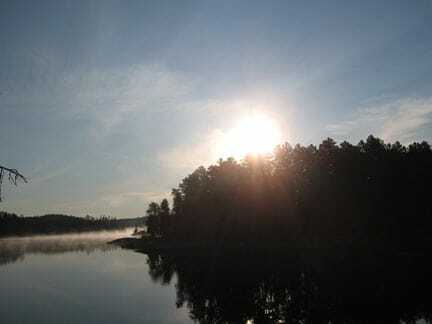 ​There is some mist rising off the lake on the far shore that is getting lost in all the color so I will brush over that area to bring back the original color. I also want to lessen the effect on the lake so I'm going to change the Opacity of my brush in the Options bar to 50% and paint over the foreground of the lake. Also a bit around the edges of the sky and the sun. To paint away larger areas I change the size of my Brush by pressing the left and right bracket keys on my keyboard. Notice how you can see the effect of painting over the photo on the Layer Mask. This step is optional, but worth mentioning. 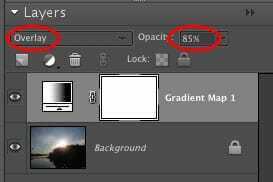 You can brighten the overall effect by creating a new Hue/Saturation Adjustment Layer and moving the Saturation slider to the right until the color intensity is where you want it.